When you design a product or a system, it often becomes clear whether assumptions, theories, dimensions and ideas are valid in practice and if the product functions as it is intended. Before a product or system is released for final production, a prototype is usually built. These tests aim to further improve the original design, validate components or demonstrate the functioning of a principle. Building vehicle technical (sub) systems. Building test setups for functional and durability testing. Developments are often based on the "V-Cycle", which works in a structured pattern from one development step to another. In the cycle from "customer wish" to "end product", terms such as a program of requirements; functional requirements, modeling, system development, testing and validation are always recognizable. Automotive prototypes are often complex compositions in which different disciplines such as combustion engine technology, electrical engineering, model and control technology, material knowledge, production technology, structural design and business aspects are covered in their constructions. Clients often have a lot of knowledge in the field of their own product, but support is often required in the other fields that are of equal importance to realize a prototype. The strength of HAN Automotive Research is that it has knowledge of all the development steps that are necessary to achieve a complete prototype. Additionally, HAN-AR can also fuse the knowledge and experience of a broadly specialized network of partner companies. Moreover, HAN-AR has a wide range of software, development and production tools that can be used for the benefit of the client. 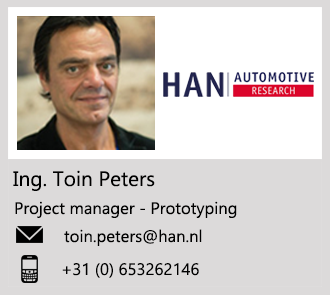 HAN Automotive Research has experience in managing complex processes involving multiple parties. Projects are carried out with research professionals, teachers and students. Contact us if your organization is looking to construct a demonstrator, workhorse, test installation or prototype.